I built my first computer 1979. 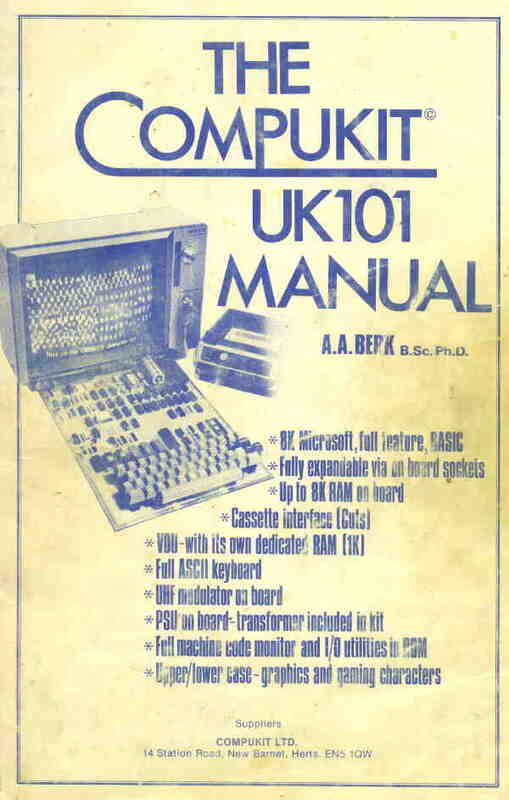 It was a Compukit UK101 bought by postal order in the UK. It was a kit and as I can remember the price was £249. Quite a lot at that time! I had been looking around some years earlier to buy a computer kit, but the price was even higher then. In 1979 the price had fallen to what I could afford. I ordered one in July 1979 and it was delivered in November, I had to wait more than 3 months. Sometimes, before I got the kit, I thought that I had been fooled. But at last the kit arrived (more than I had ordered one!) and I put it together.... and it worked! Then I had to learn how to program it! The computer had a built-in 8k BASIC-interpreter made by a person named Bill Gates. That was the start of my computer knowledge !!! Compukit UK101 (in Sweden and other countries). Please contact me and tell your experiences of Compukit UK101. Does it still exist and work ?? What did it mean for you ? ?